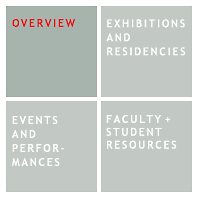 The Institute of the Arts and Sciences is an interdisciplinary exhibition and event forum in the Arts Division of the University of California, Santa Cruz. The IAS's mission is to harness the creative power of the arts and the sciences to explore big questions and critical issues of our time. It contributes to the cultural life of UC Santa Cruz and features the work of nationally renowned artists and groundbreaking scientists and scholars. The IAS offers a range of public programs, sponsors residencies, and curates and organizes an ambitious exhibition program.